Wetlands are frequently mentioned by city planners and the general public for their protective benefits against storm surges. Unfortunately, these important ecosystems are still disappearing in spite of this qualitative knowledge of their benefits. Municipalities across the nation are weighing the value of coastal wetlands for flood protection and the many ecosystem services they provide, yet there is limited quantitative information available to help make these decisions. We are conducting a study of historic and potential future green shorelines in Jamaica Bay, New York City. The primary output of the study is a “next-generation” sea level rise viewer that demonstrates the dynamically modeled effects of green shorelines on flood hazard zones. The tool also provides information on damages from flooding as well as cost-benefit analyses for green shoreline adaptations for the bay. The landscape of Jamaica Bay in prior centuries is also being mapped and floods modeled, to learn more about the resilience of past shorelines. A set of three future living shoreline adaptation scenarios is being collaboratively developed in a workshop with city planners, resource managers, and our science team. Coastal storms are among the world’s most costly and deadly disasters, with strong winds, floodwater inundation, and coastal erosion capable of damaging and disabling infrastructure. Increased damage from storm surge flooding is one of the most certain impacts of climate change, with the potential for intensified storms, increased rainfall, and with storm surges coming on top of rising sea levels. Sea level rise is expected to accelerate over the 21st Century, primarily due to increasing expansion of warming seawater and accelerated melting of land-based ice sheets. A conservative estimate of 30-60cm for New York City (NYC) by 2080 will change a 100-year flood event to a 30-year flood event, and “rapid ice-melt” scenarios call for over a meter of sea level rise over this period [Horton et al. 2010]. 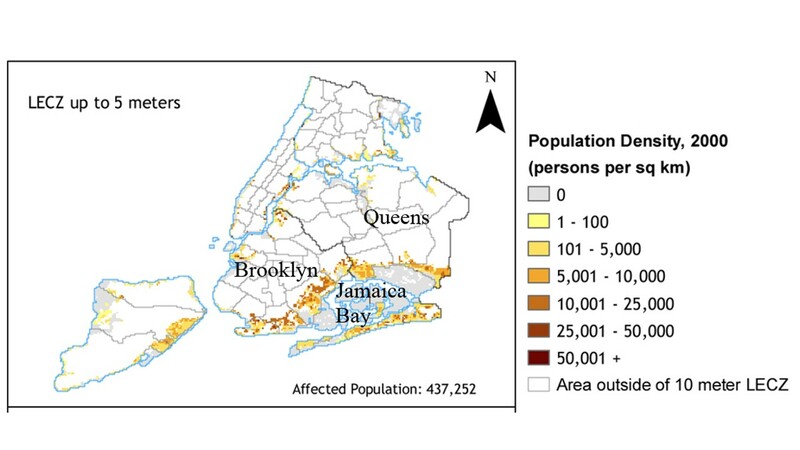 Hundreds of thousands of NYC residents in Jamaica Bay’s watershed live on land within range of a 5 m hurricane storm tide (Figure 1), and Hurricane Sandy (3.5 m above mean sea level) flooded some of these neighborhoods. Hurricanes made direct hits on NYC four times over the last 400 years including 1693, 1788, 1821, and 1893 and will likely do so again [Scileppi and Donnelly, 2007]. Moreover, sea level rise of 1 m will mean that a severe extra-tropical storm (a “nor’easter”) will lead to flooding levels nearly as bad as Sandy or the historic hurricanes – the worst nor’easters (e.g. 1992) have an annual probability of occurrence of one in twenty and cause maximum water levels of about 2.0-2.5 m [Orton et al. 2012]. Figure 1: NYC map showing population and density in low-elevation coastal zones (LECZ) below 5 m above mean sea level (Columbia CIESIN; http://sedac.ciesin.columbia.edu/gpw/lecz.jsp). Hurricane Sandy’s flooding was extensive in neighborhoods surrounding Jamaica Bay. In past centuries, a large expanse of tidal wetlands, oyster beds, riparian systems, barrier beaches, and shallow water depths in and around Jamaica Bay likely helped shield Southeast Brooklyn and South Queens from storm surge flooding. Today those wetlands are depleted, the oysters gone, the riparian systems and barrier beaches partially paved over, and the depths of Jamaica Bay altered by dredging and land fill. A successful experimental Corps of Engineers program that has rebuilt a small portion of the tidal wetland islands in Jamaica Bay from 2009-2012 raises the possibility that these losses can be reversed, but the cost of rebuilding the losses from 1974-1999 alone has been estimated to be $310 million at ~$500/acre [S. Zahn, NY State Department of Environmental Conservation, pers. comm, 2012]. Nationwide, living shorelines of many types are still disappearing, in spite of society’s qualitative knowledge of their benefits. In recent decades, the decline of tidal wetlands has continued [Dahl, 2006]. Much like wetlands, shellfish reefs also can provide protective benefits from storm-driven waves and flooding, due to their rough surfaces and added frictional effect on rapidly moving waters. Unfortunately, wild oyster biomass in U.S. estuaries has declined by 88 percent over the past century [Zu Ermgassen et al. 2012]. These changes are likely only partially a result of sea level rise – both wetlands and shellfish reefs are to a varying extent ecosystem engineers and can grow upward with sea level rise, though the maximum rates at which they can rise are uncertain. Other issues that continue to wipe out wetlands include eutrophication due to excessive nutrient inputs [Deegan et al. 2012], a particularly difficult problem to solve in urban estuaries, typically requiring billions of dollars in grey infrastructure [e.g., NYC-DEP, 2010; Taylor, 2010]. Quantifying the economic values of these protective services for socioeconomic analyses is a crucial step for conserving these beneficial coastal ecosystems [NRC, 2005]. NYC and many other municipalities across the nation are weighing restoration or protection of living shoreline ecosystems, yet there is limited quantitative information available to help make these decisions. An old rule of thumb holds that 14.5 km of wetlands reduces a storm surge by 1 meter, though this is based on an observational study of historical Louisiana hurricanes that actually showed variations of over a factor of three in the surge reductions [USACE, 1963]. More recent research has shown that the attenuation of storm surge by marshes actually varies even more than a factor of three, and wetlands sometimes do not attenuate storm surges at all. The attenuation by wetlands depends on many details including direction and duration of the storm’s winds and waves, and the coastal topography and bathymetry around the wetlands [Resio and Westerink, 2008]. It is becoming accepted that the protective benefits are larger for storms with winds that blow onshore only for a short duration [Gedan et al., 2010; Resio and Westerink, 2008]. This is an important factor for the NYC region, because historical hurricanes making landfall in this region have moved rapidly at speeds of 45-110 km h-1 [Orton et al. 2012], often passing in only a matter of hours, so coastal wetlands may have more protective potential than in other places where hurricanes often move more slowly. A key opportunity exists to leverage existing model-based flood zone mapping and risk assessment work, and use them to help quantify the value of living shorelines and map their flood protection services. The Federal Emergency Management Agency (FEMA) has embarked on an ambitious effort to re-evaluate the nation’s coastal flood hazard for the purpose of updating all the coastal flood zone maps. Many of these regional efforts are utilizing hydrodynamic modeling of storm surges, and FEMA is amassing and producing detailed and publically-available datasets for areas such as New York, New Jersey, Delaware Bay and Philadelphia, Mississippi, South Carolina, West Florida, and Florida’s Big Bend. Using hydrodynamic models and accounting for simple frictional influences of land-cover data, it is possible to use these data with storm surge models to quantify the influence of coastal wetlands and shellfish on the particularly sensitive and expensive issue of flooding. Quantify the flood resilience of historical versus present-day coastal zone using model runs of the Stevens Estuarine and Coastal Ocean Model (sECOM) that is used within the Stevens Storm Surge Warning System (http://stevens.edu/SSWS). Give both decision-makers and the general public an online tool that helps them obtain an improved, quantitative understanding of the role that living shorelines like wetlands and shellfish reefs can have on coastal flooding. The tool will enable users to explore future flood zones, and to select future living shoreline adaptation scenarios to view their influence on these flood zones. Dahl, T. E. (2006), Status and trends of wetlands in the conterminous United States 1998 to 2004, 112 pp., Washington, D.C.
Deegan, L. A., D. S. Johnson, R. S. Warren, B. J. Peterson, J. W. Fleeger, S. Fagherazzi, and W. M. Wollheim (2012), Coastal eutrophication as a driver of salt marsh loss, Nature, 490(7420), 388-392. DEP (2007), Jamaica Bay Watershed Protection Plan, Volume 1, edited, p. 128pp, New York City Department of Environmental Protection (DEP), New York. Gedan, K. B., M. L. Kirwan, E. Wolanski, E. B. Barbier, and B. R. Silliman (2010), The present and future role of coastal wetland vegetation in protecting shorelines: answering recent challenges to the paradigm, Climatic Change, 1-23. Horton, R., V. Gornitz, M. Bowman, and R. Blake (2010), Chapter 3: Climate observations and projections, Annals of the New York Academy of Sciences, 1196(1), 41-62, DOI: 10.1111/j.1749-6632.2009.05314.x. NRC (2005), Valuing ecosystem services: Toward better environmental decision-making., National Academy Press, National Research Council, Washington, D.C.
NYC-DEP (2010), NYC Green Infrastructure Plan: A sustainable plan for clean waterways, 143 pp, New York City. Orton, P., N. Georgas, A. Blumberg, and J. Pullen (2012), Detailed Modeling of Recent Severe Storm Tides in Estuaries of the New York City Region, J. Geophys. Res., 117, C09030, DOI: 10.1029/2012JC008220. Resio, D. T., and J. J. Westerink (2008), Modeling the physics of storm surges, Physics Today, 61, 33. Scileppi, E., and J. P. Donnelly (2007), Sedimentary evidence of hurricane strikes in western Long Island, New York, Geochemistry, Geophysics, Geosystems, 8(6), DOI: 10.1029/2006GC001463. Taylor, D. I. (2010), The Boston Harbor Project, and large decreases in loadings of eutrophication-related materials to Boston Harbor, Marine pollution bulletin, 60(4), 609-619. USACE (1963), Interim Survey Report, Morgan City, Louisiana and Vicinity, in serial no. 63, edited, U.S. Army Corps of Engineers District, New Orleans, LA. Zu Ermgassen, P. S. E., et al. (2012), Historical ecology with real numbers: past and present extent and biomass of an imperilled estuarine habitat, Proceedings of the Royal Society B: Biological Sciences, 279(1742), 3393-3400.